The more frequently insecticides with the same MOA are used, the more likely resistance will occur. Once resistant insects have been detected, curbing the spread of resistance is exceedingly difficult. The best practice is to reduce the chance of resistance developing in the first place. If repeated applications of pesticides are necessary, alternate insecticides with different modes of action against the pest so that no more than two consecutive applications are made with the same MOA. The insecticides used in a rotation or tank mix (see below) must be active against the target pest. 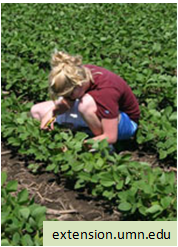 For help in identifying classes and insecticide mode of action, see Spraying by the Numbers. For some cropping systems, insecticide applications are often arranged into mode of action spray windows or blocks that are defined by the stage of crop development and the biology of the target pest(s). Several sprays of a compound may be possible within each spray window but it is generally essential to ensure that successive generations of the pest are not treated with insecticides from the same MOA group. Consult local expertise with regard to spray windows and timings. Follow label directions for the proper application method and rate. Using reduced application rates favors survival of the stronger individuals in the pest population. The use of lower rates where possible is a good practice, but it is not a scientifically-proven resistance management technique. Minimize the use of long-residual insecticides. When persistent pesticides must be used, consider where they can be used in a rotation scheme to provide the control needed and with a minimum length of exposure. Select insecticides that are least damaging to populations of natural enemies. When feasible, spot treat (e.g., field edges or other hot spots) or leave unsprayed areas within treated fields or adjacent “refuge” fields. The pesticide-susceptible individuals in the untreated area will interbreed with resistant ones and dilute the resistance genes in the population. Keep good records of insecticide use to aid in planning for future years. 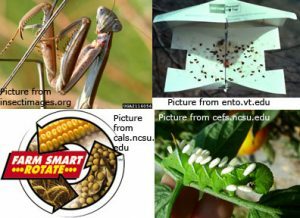 Note the insect species that were present in the field, which insecticides were applied and where, and the level of control that was achieved. Record the rate, timing and number of insecticide applications made. Applying two or more pesticides with different modes of action in a tank-mix or pre-pack may delay the onset of, or mitigate, existing pest resistance. Tank-mixing allows for adjusting of the ratio of pesticides to fit local pest and environmental conditions, while premixes are formulated by the manufacturer. The different pesticides in the mixture must be active against the target pest so that insects with resistance to one mode of action are controlled by a pesticide partner with a different mode of action. Theoretically, repeated use of any tank-mix or pre-pack combination may give rise to insecticide resistance, if resistance mechanisms to each insecticide in the mix arise together but the probability is very low.